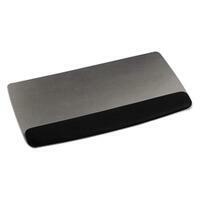 Gel wrist rest platform features antibacterial protection and tilt adjustability. Adjusting the tilt helps keep wrists properly aligned with your keyboard. Sleek design includes a tapered leatherette covered wrist rest and no hard edges. Softer gel with a cushier feel provides optimal wrist comfort.